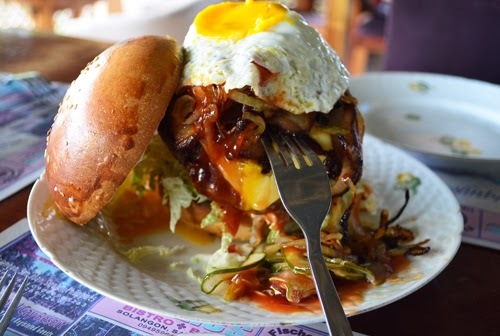 One of the things you should do when visiting Siquijor Island is to try challenging your stomach to eating giant burgers. For a laid-back island known to be uniquely peculiar of its conventional richness, I never expected there would be foodstuff known only to be eaten by routined people on the go in noisy and 'to go' cities, is served extraordinarily appealing in this secluded and gloriously private resort along the cliffs of the island of fire. So, without further ado we headed to the resort with our multicab service to try it for ourselves. 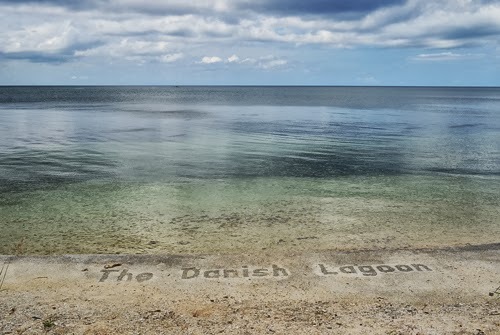 The resort’s name is ‘The Danish Lagoon’, said to be Jessa and Dingdong Avanzado's favorite stop when they're in the island. 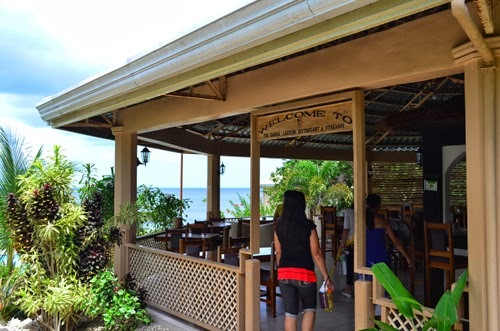 It’s nestled along the quiet cliffs of Brgy. Paliton and it’s about a ten-minute jeepney ride from the town of San Juan. 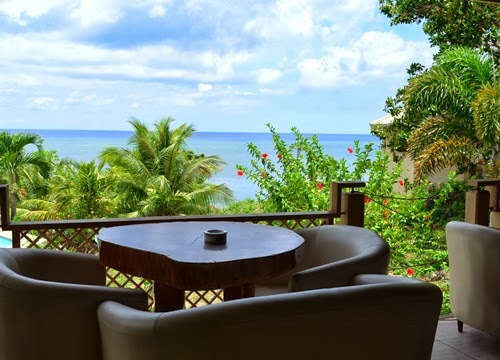 This resort isn’t accessible by public vehicles, but there are a number of single motorcycles, tricycles in the ‘centro’ that you can contract to bring you here. 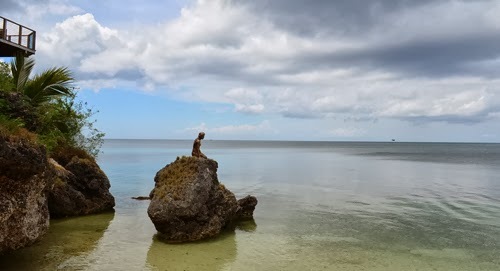 There are now a number of resorts operating in this island and mostly run by foreign nationals with their Filipina wives/friends as business partners. The Danish Lagoon in particular, well, as the name suggest is run by Danish nationals with their courteous wives attending the counter, so it’s safe to say and it follows that you won’t be eating ‘kayot’, a local delicacy made out of cassava, the whole time you’re staying around the island. 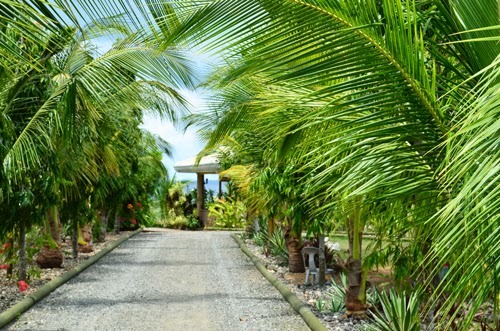 You’ll be greeted with dwarf palms as you arrive at the resto entrance, the place is cozy, breezy and the air of complete muted privacy abounds the space, perfect for summer retreat. Since we’re all hungry we placed our orders with the help of the gracious ladies at the counter. 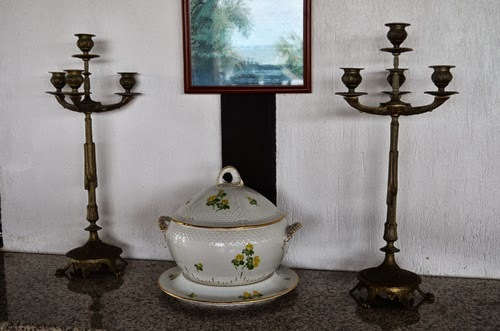 I was amazed by their fine China display, the lady who attended to us and who introduced herself as a wife of the owner said, all of their effects here were shipped all the way from Denmark, even the meat that they use for the burger, wow, all the more I’m excited to savor their giant burgers. So, finally it came and just as I expected, they’re as big as these; Call it my bad but valid excuse, sometimes you just have to forget the food’s name and let your senses remember it. I now mother burger eating kids, somehow I would know by my nose that there’s a burger around but having this on the table completely change everything. It’s like another delectable sandwiched meat thrown out from giant food planet. If you’re a hearty eater this serving is for you, but I’m just a small portion eater so this is quite hyperbolic for me, but of course meant for sharing, perfect for five. 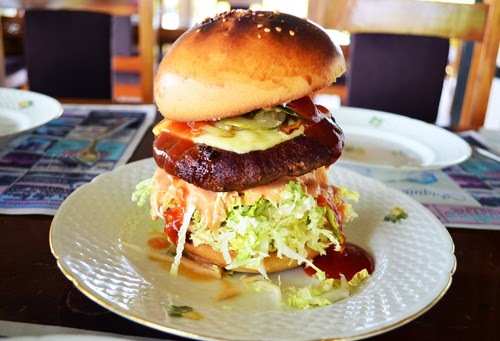 Patties make or break a burger, the meat was grilled over a smokeless griller so it doesn’t smell burnt, they have this special sweet and sour sauce that compliments the veggied and toasted bread. The only difference is that this one has sunny side up on top of it. I have to support it with a fork for the photo opp as it topples due to the sauce. 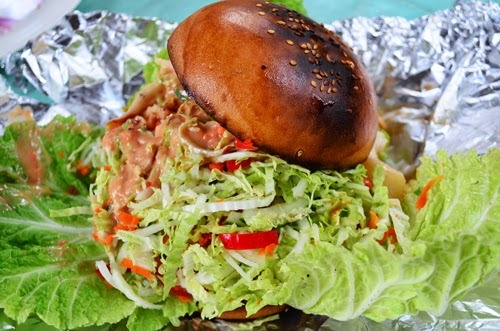 This one is their vegan version, nothing special actually, just a large bun stuffed with coleslaw and more coleslaw. 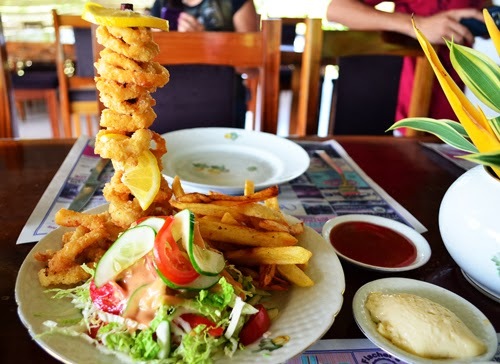 The calamare and fries tower, we had two of these. As I was eating I prayed that, Lord, if this will be my last meal, I wouldn't regret a bit to see you sooner than expected - they're really good and they're really heavy.